A tax deduction is the amount by which your taxable income is reduced. It leads to overall lower tax liability or larger refund and for that reason decision between standard or itemized deduction can translate into significant dollar amount. According to the IRS, every year 2 out of 3 taxpayers choose standard deduction when filing taxes. Many select that option because it’s faster, especially if filing is postponed until the last moment. Itemized deductions require much more time and effort, supporting receipts, and not always produce bigger saving. The best way to verify which deduction method is more appropriate for you is to calculate taxes using both methods and select one that generates better results. When filing as Married filing Separately and your spouse decides to itemize. You decided to change your annual accounting method and your tax return is for less than 12 months. Your emigration status is nonresident alien or a dual-status alien; exceptions apply if you are married to a US citizen or resident at the end of the year. You are organized as a partnership, trust, estate, or common trust fund. 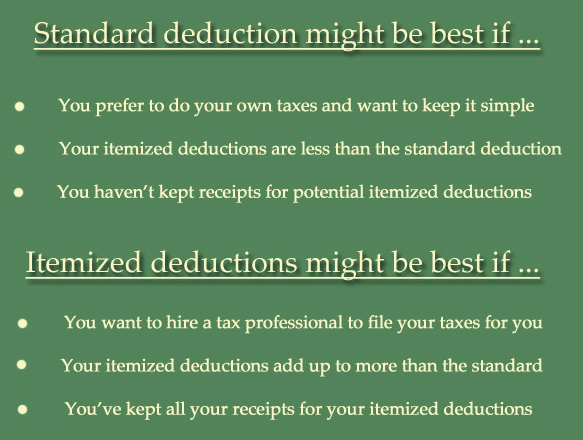 When itemizing deductions can be beneficial? Large medical and dental expense. Mortgage payments and real estate taxes. Unreimbursed expenses as an employee. Incurred losses due to theft, disaster, or casualty such as fire, flood, etc. Making contributions to qualified charities. Many itemized deductions have certain thresholds that must be met in order to be valid. Additional details on those thresholds can be found in Section 21, Publication 17. Home software programs like TurboTax and H&R Block at Home will be able to guide you through the process. If you decide to itemize your deductions, you have to file Form 1040. Taking standard deduction allows you to file Form 1040, 1040A, or 1040EZ.